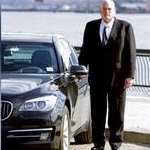 New York City taxi drivers held a vigil on Tuesday to honor livery car driver Douglas Schifter, who killed himself in front of City Hall Monday morning after writing a long Facebook post condemning local politicians and Wall Street-backed apps like Uber for pushing him into financial ruin. New York City taxi drivers held a vigil on Tuesday to honor livery car driver Douglas Schifter, who killed himself in front of City Hall Monday morning after writing a long Facebook post condemning local politicians and Wall Street-backed apps like Uber for pushing him into financial ruin. He wrote, “I worked 100-120 consecutive hours almost every week for the past fourteen plus years. When the industry started in 1981, I averaged 40-50 hours. I cannot survive any longer with working 120 hours! I am not a Slave and I refuse to be one… There seems to be a strong bias by the Mayor and Governor in favor of Uber. A Company that is a known liar, cheat and thief.” Over the past five years, the number of for-hire cars has more than doubled in the city, largely thanks to Uber. But the soaring number of cars has resulted in a financial crisis for many longtime taxi drivers who now struggle to get customers. In Maryland, closing arguments are scheduled to begin today for two Baltimore police officers who are part of what has been described as one of the most startling police corruption scandals in a generation. The officers were part of an elite plainclothes unit called the Gun Trace Task Force—but, according to prosecutors, the unit acted more like a criminal outfit. In his opening argument during the trial, the lead federal prosecutor, Leo Wise, said, “They were, simply put, both cops and robbers.” According to prosecutors, the officers stole hundreds of thousands of dollars from city residents. They broke into houses. They stole drugs and then gave them to drug dealers. They carried BB guns that they could plant on people they shot. Six members of the task force have already pleaded guilty. The NAACP and the NAACP Legal Defense Fund have sued the Department of Homeland Security over its decision to rescind the temporary protected status (TPS) designation for Haitian immigrants. In Ohio, a 16-year-old girl who killed her abusive father is finally home from juvenile detention, after her case sparked national outcry over the treatment of domestic violence survivors. The young girl, Bresha Meadows, was just 14 years old when she shot dead her abusive father, Jonathan Meadows, with a bullet to his head as he slept. Only two months earlier, Bresha had run away from home, telling relatives that she was scared for her life “because her father was beating her mother and threatening to kill the whole family.” Bresha was sentenced to a year in juvenile detention, with credit for time served, as well as six months at a mental health treatment center. Just reading the summary for this headline story about the cab driver is so heartbreaking. Must it be so difficult for human beings to innovate while still keeping in mind the greater good of all involved? Adaptation can be hard, but it’s made so much harder by those who pursue great wealth at any cost.